The 24.6 metre classic motor yacht Stalca has had a central agency change and is now listed for sale by Van Der Vliet Quality Yachts. Stalca was built by Dutch yard Visch Holland and delivered in 1971 for Prince Rainier of Monaco. Her name is an abbreviation of the Christian names of Prince Rainier and Princess Grace's three children: STéphanie, ALbert and CAroline. In 2011 she completed a major refit to the highest standards respecting all the magnificent 1970s decoration made for the Royal Family. Her most recent refit in 2016/17 has seen her almost fully rebuilt, with new paint, wiring, plumbing, A/V and extensive hull works undertaken, in addition to many other upgrades. This yacht for sale sleeps eight guests in four cabins. The full-beam master suite is situated aft and there is a full-beam VIP suite amidships, both with full en-suite facilities, while behind them are two twins with shared facilities. The saloon/dining room is open plan, with a relaxation area aft and formal dining room forward. Twin 315hp Caterpillar engines give her a cruising speed of nine knots. 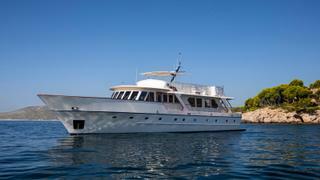 Commercially compliant and in turnkey condition, she offers an excellent opportunity for private or charter use. Stalca is asking €1,100,000 with VAT paid.